Motorhome owners like to keep their vehicles squeaky clean! You’ve no doubt paid thousands of pounds (if not tens of thousands) for your motorhome so you’ll want to keep it looking its best. 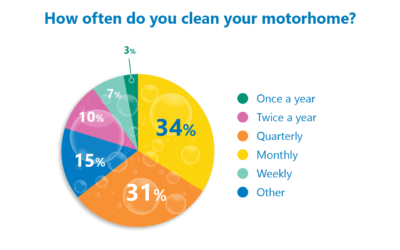 And our latest poll shows that motorhome owners do like to keep their vehicle nice and clean throughout the year. In last month’s community poll we asked how often you clean your pride and joy as we shared our guide to cleaning your motorhome. With nearly 300 votes, it’s clear that those who voted like to keep their motorhome spick and span all through the season, with a third saying they clean their motorhome monthly and 31% grabbing the shampoo quarterly. Seven per cent of voters cleaned their motorhome weekly and just three per cent only did it once in a year. But many commented to tell us they usually give the motorhome a clean after every trip away or whenever it’s looking dirty. Spring and Autumn can often mean lots of insects and mud on the motorhome, so many will give the underside a good spray, particularly if they’ve been on a muddy campsite. And for those who use their motorhome in winter, they like to give their vehicle an thorough clean to remove any salt residue and the after effects of bad weather and dirty road conditions. But some will leave task of cleaning to the professionals and call in a motorhome valeter! Here’s what some of you had to say…. Maryann Plumbley, clean and waxes her motorhome before putting it away for winter and whenever it gets dirty. Fred and Lloyd have similar views, cleaning their motorhomes after every use, and continually giving them a polish – including roof. “I don’t understand people driving dirty vans,” said Fred. Lloyd also leaves all cupboard doors open when not in use to help fresh air circulate. What do you make of the results? Feel free to share your comments in the box below. totally agree that using a pressure washer is a no no. a lazy way to clean your van ,also can cause damage to older vehicles. Using a pressure washer to clean a motor home or caravan is a definite no no. Eventually it will damage the seals and you can look forward to significant water ingress.